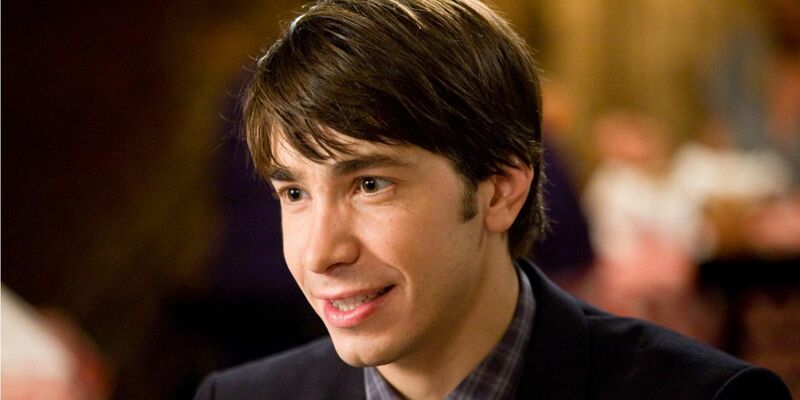 In 2019, Justin Long has the same baby face he did back in 1999's Galaxy Quest, but he's come a long way in Hollywood since those days, starring in a wide variety of movies and television shows. From Live Free or Die Hard and Idiocracy to Tusk and Drag Me to Hell, the forty-year-old actor refuses to be pinned down to any one genre or style. Long's latest film, Tall Tales, is based on the children's books by Antoon Krings, who also wrote and co-directed the adaptation. Justin plays Apollo, a singing and dancing cricket who stumbles into the garden of Queen Marguerite (Kate Mara), just in time to be framed for her kidnapping by nefarious forces within her own inner circle. Adventure, comedy, and charming whimsy ensue. Tall Tales is available exclusively to DirecTV subscribers and debuts in theaters on January 11. While promoting the film, Justin Long spoke with us about a wide variety of topics, including his extensive portfolio of voice acting work, his prospective career in podcasting, and his goal of writing and directing his own feature films. He also told us about his work with The Girls Home, a Nicaraguan charity, and his continuing quest to learn how to speak Spanish. We've watched you grow up on TV. Galaxy Quest was back in 1999, and you're 40 now. I just realized I've been doing this for just about half my life. Well, it's time to move on to different pastures, I guess! No, what I really like to do is write and direct stuff with my brother. We've been making a lot of shorts, one of which had a little bit of success on the internet and has led to the potential to direct a feature. So, I think that's what I would like to do. I really love making these little movies, so that's the next thing I'm hoping to do, is to direct a feature. Hopefully, that will work out! Do you have a specific idea, do you want your film to be an expansion of your short film? No, it's a script we wrote already. We're hoping to do it this Spring. It's a buddy odd-couple comedy, which is a genre we both really love. I grew up watching Laurel & Hardy, Planes, Trains & Automobiles... Movies like that have always inspired me, and Neil Simon's Odd Couple. I'm sure we'll be hearing a lot about that really soon! So, I just watched Tall Tales, and it is completely adorable and so very French. Yes! (laughs) Yes it is! It is both of those things in equal measure, and I love that. Yeah, I can see that on the poster now! "It's adorable and so very French!" It really is. It's a French film, and it had been completed already. I found it really interesting how they translated some of the more... Shall we say, "French moments," for an American audience. I think that was their challenge with the movie. You did the dubbing. It was already made and you were brought on after the fact. How do you prepare when you're doing that? Do you listen to the original version? I don't know if you speak French or not, but do you reference that performance? I suppose I could have... But I didn't, because I don't speak fluent French, but I don't know how much it would have been of value. And also, I think they had to change a lot of the lines. I don't just mean from French to English, but I think they had to rewrite some stuff entirely. It was really a matter of starting fresh in terms of the voice and allowing the animation to guide me. I did job called Walking with Dinosaurs (2013), which was similar in that it had already been animated. So you're working within more limited confines. The other voice work I've done, you start with the voice, and then they animate to you. But this was a little more confining because you only have so much you can do within whatever that character's animation is on the screen already. It's still fun! That's the challenge, it's fun to come up with as many different things as you can do within those confines. Did you get to meet writer/director Antoon Krings? No! No, I didn't. But I wish I had, because I would tell him how much I enjoyed watching his animation, and the story unfold. I would also tell him I like his name. Antoon. A great name for someone who works in animation: 'Toon. Almost too great. Suspiciously great. Maybe that's not his name! You've done a lot of voice work. I'd say you've done more voice work than the average Hollywood A-lister. And you have such a great voice for it. How did you get started in that corner of the acting world? I love doing it. When I started out as an actor, when I was a kid, twenty years ago, my first few jobs were all voice jobs. They were for commercials. At the time, I had dropped out of college, I was 19 or 20, and a really common voice, at the time, one that I was asked to do at a lot of these auditions, was, (affected) "like, a stoner, that guy, yes you can! Extreme! He slams Mountain Dew, you know? And he snowboards!" And I'm not that type of person at all, but I was a late bloomer, and my voice was still kind of developing, it was still kind of going through puberty. So, my voice was better attuned to that type of guy. The first few jobs I got were with that sort of voice. That late-90s slacker character. Mountain Dew, Domino's. Later, I did a movie with Mike Judge (Idiocracy, 2006). I met Mike on his movie, and he started calling me in every once in a while to do an episode of King of the Hill. So I played some miscellaneous characters. He knew I did voices, because I tried some for him, unsolicited, in a very obnoxious way, one night out, after a couple of beers. I got to play around with different voices on King of the Hill. And then I did Alvin & the Chipmunks and more. It's just so fun. It's funny that you mention having such a young voice at the start of your career. One would imagine you would have grown out of it, and yet, you're on one of my favorite shows, F is for Family, playing a teenage boy! Oh yeah, right! Well, that's different, because that character is more (breaks into Kevin Murphy's voice) "he has the attitude of being a kid, of being a teenager." He's constantly disgruntled. He's a real teenage misanthrope. "Nothing's fair! Nothing's ever fair! Everyone is a dil**" and it's so fun to do that, because I don't necessarily have to change my voice the way I would with... I've done teenage characters (affects a high-pitched nasal whine), "I've done those characters where I insert some voice cracks into it!" But Kevin has a deep voice and he's all testosterone. He's brimming with hormones. That's what's so fun about that character. There's a real freedom in just being constantly disgruntled by everything. Things happen to us in life and we're frustrated, but maybe it's just me, but that frustration has go somewhere. Some people meditate, listen to music, do drugs, however they allow that frustration to escape. The great thing about doing that show is, it's kind of therapeutic to play such a frustrated person. I get to yell at Bill Burr! There's no one more fun to yell at, because there's no one better at yelling and cursing than Bill Burr. It's like playing one on one basketball with LeBron; you're doing it with the best! You're screaming at the best! It's really fun. I can't wait for season four. You're not doing anything yet for that, right? Is it on the time table? Or is it a secret? It's on the time table, yes. I think we're gonna start recording soon. Soon. It's definitely happening. Excellent. I can't wait. I listened to you on my favorite podcast, Anna Faris is Unqualified, and you mentioned on Twitter that you recorded a podcast of your own, with Sam Rockwell. Is that a pilot, a one-off, what's the deal with that? I think they wanted to see how it would turn out. I think they were happy with how it turned out, so I think it's proceeding. I think it's something I'm going to do. I just don't know when or how official, but it looks like it's going to happen. It's funny you mention Anna's thing, because that was a couple of years ago, but ever since I did that, it was so fun to do, I love that medium, and since then, I've kind of been fantasizing about doing one. I love picking people's brains and getting into it with them. I hope it happens. It looks like it's going to happen. You work with The Girls Home. Can you tell me a bit about it? A lot of Americans go to San Juan del Sur, which is how I stumbled upon it, but I'm so glad I did. This was years ago. It is a home run by an order of Catholic nuns, and you can find it on the web. It's a place that houses and educates and shelters young women who are at risk, either from abuse or abject poverty. They're what's called "social orphans." Most of them, technically, do have parents and places to live, but their circumstances are very difficult, for a variety of different reasons. The goal of this place is to get these girls through the years that would be a real challenge outside of the home. The endgame is to hopefully get them to the university. This year, there are three girls who are in university. From where the home started a couple of years ago to how far they've come, it's something I'm really happy about. But they can always use money, they want to expand, especially now, with all the violence over the last six or seven months in Nicaragua, they're especially at risk. Whatever donations have come in in the last year, they've been appreciated tenfold because they've kept the girls safe and fed and out of harm's way. It's a really good thing right now. It's a really rare thing. You do incredible work with them, it's truly inspiring. Thanks. I love it. I've gotten to really know a lot of them down there. I just adore them. And they're always looking for volunteers. It's a really fun way, if you're interested in traveling to Nicaragua, which is a beautiful country, it's a really nice way to do that. It's all on the website. How do you deal with the language barrier? Do you speak Spanish? You know, it's funny, every time I go there, it gets more and more frustrating. At first, it was sort of a challenge, communicating with the kids without knowing any Spanish. So, you end up relying on very primitive communication skills, which can be fun! I love Charlie Chaplin! I love resorting to making faces and miming things. It can be really fun, but it's so limiting. After a couple of days, it becomes really frustrating. After years of going there... Every time I leave, I am so determined to learn Spanish. I have this app, Duolingo, where I do it like gangbusters for a couple of months, and then I just set it aside for whatever reason. This has been going on for years. It's my 2019 resolution, to finally learn Spanish. It's never been in there enough to retain it. It all goes away after a couple of weeks. I have to do it every day. I have to learn that Spanish! This entry was posted by Screen Rant on January 9, 2019 at 3:01 am, and is filed under Interviews, TV News. Follow any responses to this post through RSS 2.0. You can skip to the end and leave a response. Pinging is currently not allowed.